Kitchen and Residential Design: Every picture tells a story don't it? As a designer, I believe that every room tells a story too. Whether it's consciously or unconsciously told, there's a narrative that connects a room. So with that said, what story does a bathroom that looks like this tell? And here it is in silver, though to class it up we'll call it platinum. So what's the story? 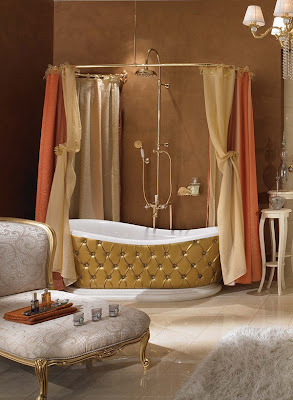 Or more tellingly, what story would you tell after coming into contact with a bathroom such as this? When it comes to home furnishings, don't discount the buying power of the Middle East. Raina I was thinking the same thing --Dubai. Melody: Liberace would have loved Dubai. 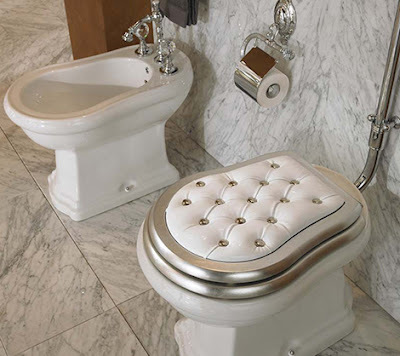 won't lie, I'm totally jealous of the bathroom with a bidet.. but otherwise the whole scenario seems to scream "I'm so important that I need space to entertain in my bathroom." That, and "I have terrible taste in decor". Nim: I love a bidet too. It's makes a catchy tune when sung to the melody of "I Love a Parade" by the way. You know it's funny, I used to refer to things being too Vegas when I thought something was tacky. More and more though, I'm substituting Dubai for Las Vegas. It looks like a bathroom that nobody ever uses!! We don't have that much reader overlap, go for it! The story? 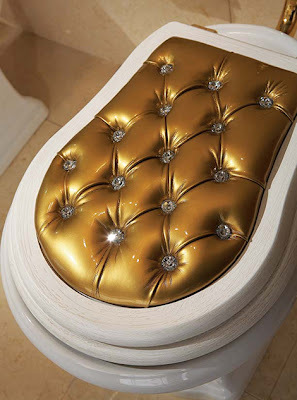 I have far too much money and spend far too much time in my bathroom that I need a padded tub and jeweled toilet seat. 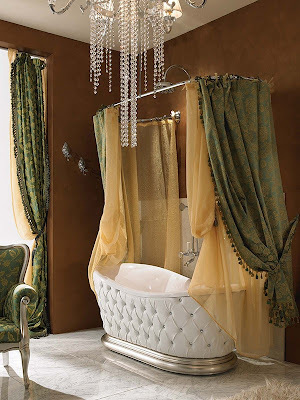 I'd feel like a princess for about 30 seconds and then feel lost in a bathroom like this. Hey Amy, welcome to K&RD. Melody up there lives in Lancaster and Kathleen, another regular commenter is in Lititz. It's like old home week around ehre all the sudden. Fancy Feast, that's a good one. So Moggitt Girls, would the owner of such a bathroom be able to cheap out and buy Scott toilet paper or is Charmin a requirement in a room like this? The only thing missing in this room is the servant required to wipe the hiney. Yes... I really said that. I was thinking along the same lines Victoria. It's a stage set for the next Lady Gaga video! Gaga does Dubai? I think she'd run afoul of their dress code. Ok, so weeeeell....done poorly....but, what if you did have the space to make the bath a "baaaaathhhh" where you relax and read a book amongst beautiful materials and you had a sumptious tub ( not padded...the only padding like this should be in a cell...in Dubai) where you can soak in a bubbly tub...that means a bubble bath with champagne for those of you "not in the know" like me:)...esp if you had a floor to ceiling window with a view of.....hmmm.....paris? New York? ...I would say Divine! However, this one ain't it. Give me a bath with a floor to ceiling view of Rome and I'm there! There's no crime in Italy, what are you talking about? Brings back memories of Lifestyles of the Rich and Famous. It does indeed. I wonder what ever happened to Robin Leech?